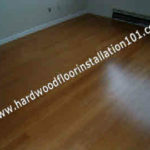 A beginner floor installer should become acquainted with all the wood flooring types. Knowledge and understanding of the material with which you work will help you not only learn some techniques to install it, but they will also help you become a competent professional and build a solid customer base quickly. So, there are only two basic wood flooring types – solid and engineered. Let’s look at them closely to learn how to better work with them. The word solid means that every board of this hardwood is made from solid pieces of wood from top to bottom. Both the width and height of solid wood may vary. The thinnest boards are 5/16 of an inch and the most extensive are ¾ of an inch. Depending on the thickness, width and length of the pieces, the solid wood has minor differences in the techniques of hardwood flooring installation. In addition, in our practice you will find two types of solid wood – prefinished and unfinished flooring. 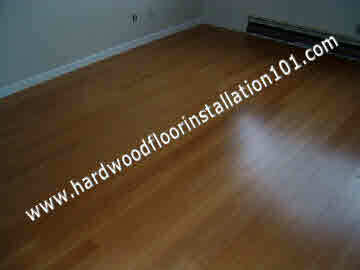 Prefinished hardwood flooring does not require further intervention and is ready for installation. It is suitable for both the client and floor installer due to the fact that during installation the result is visible immediately. Many floor installers like to install unfinished hardwood flooring, as their little mistakes during the installation will be corrected by the sanding guy. After a solid wood is purified by a sander drum, it is covered by stains (which is optional) and multiple layers of lacquer. In addition to solid wood, there are engineered hardwood floors among wood flooring types. In contrast to the previous type, consisting of a single piece of wood, it’s going, but rather glued on parts. Manufacturers use multiple types of materials for its production – plywood or HDF, various wood fibers. Only the top layer of engineered hardwood floor contains a thin layer of wood which thickness can vary from 1/8 of an inch to ¼ of an inch. As a solid wood, engineered flooring can be used as prefinished and unfinished. Both wood flooring types, solid and engineered, can be installed in three ways: as a floating floor, by nails/staples and glue down. Floating method installation is so named because the boards of the material attach to one another only with help of tongue and groove and not in any way attached to the subfloor. For sound insulation you can use several types of underlayment or cork. Least likely in this way establish solid wood. In this case, all of its boards must be straight and very smooth, short, and high in quality. The following method of installation is nail down. To use it you need to have several types and sizes of nail guns. Depending on the thickness of the material you will use nails or staples of various lengths. You will need to use special paper on the sound barrier: wax paper or tar paper. And finally, the third method of installation is glue down. With this method you can stick any kind of floor on a wooden or cement subfloor. In this case, the adhesive acts as a sound barrier. If the sound barrier needs to be strengthened, it a cork is usually used for this purpose, which in a single layer bonded to subfloor. Only after installing the crust can you stick on hardwood. Each floor installer has its own installation preferences of for flooring types. These preferences depend on their experience with installation. For example, the more you practice setting a solid wood, the more you will like this type and so on.